To make banking transaction much more simplify ,SBI has start a new feature to transfer Money to someone account without knowing beneficiary bank account detail. This facility is currently available on Internet banking of SBI. and SBI mobile apps. 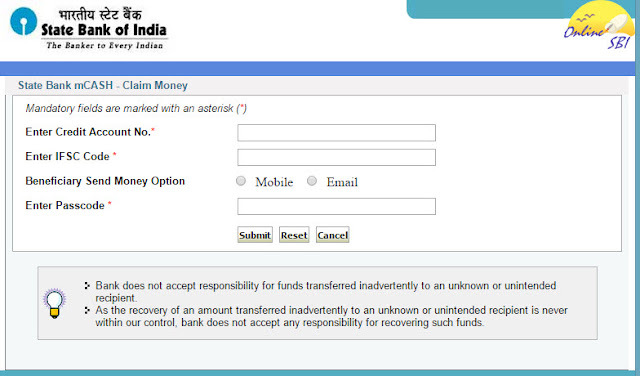 Under this transaction Send need to fill amount to send ,Email ID or Mobile number of Beneficiary. This.This option is available on Internet banking platform under PAYMENT and Transfer menu. Sender need to have Internet banking facility to avail this feature. Once the sender submit the request Beneficiary get a PASSCODE on their Mobile number or email. 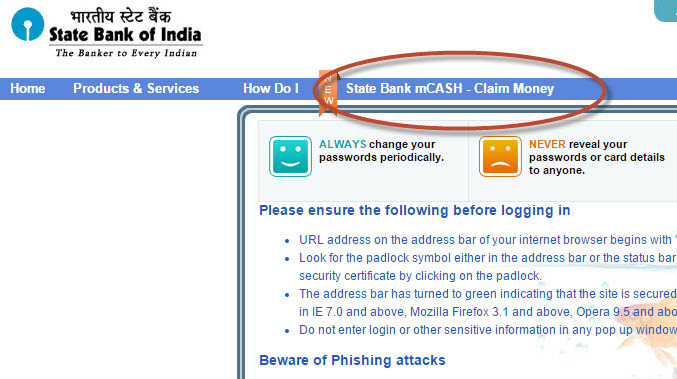 Beneficiary need to visit https://retail.onlinesbi.com/retail/login.htm and Click on State Bank mCASH-Claim Money on Horizontal menu.Beneficiary need to fill his account number in which he want to get money with IFSC code and Passcode. Once these detail are filled correctly beneficiary need to submit it. 1) Transaction limit Rs.1000/- per transaction. Day limit Rs.2000/-. However, the maximum limit of fund transfer should not exceed Rs.5000/- in a month, per user. 2) The customer would be charged at Rs.2.50 per request. 3) Redemption is subject to availability of funds in sender's account at the time of claim. 4) No charges for redemption. 5) In case of wrong entry of account number or beneficiary details, the same will be rejected by the system and amount will be reversed in sender's account within the stipulated time frame. 6) The Passcode entered should be valid. Passcode expiry period is 5 days from the date of creation. 7) Please note, as per RBI instructions, credit will be effected solely based on the beneficiary account information. Bank will not be liable for any wrong information given by the claimant. 8) Credit to the other bank accounts will be done through IMPS only. 9) The Bank shall not be responsible if the customer has mentioned a wrong mobile number/email address and the money has been transferred to the holder/receiver of the said wrong number/email by debiting customer's account. 10) The Bank shall not be responsible in any way if the passcode is shared by the beneficiary and /or misused by any third party due to any negligence act of the beneficiary or lost/theft of cell phone of the beneficiary. 11) The beneficiary must have smart phone &/or email ID and should be conversant with the use of internet based applications.